"Snow Drifts" / "There's No Place Like Home"
Maybe Once Upon A Time should quit with these Big Bads and episodes-long sagas into places like Oz and Neverland. Tonight’s season finale was about the most fun I’ve had watching the show all year, and it involved a (two-hour, but still) single journey for Emma and Hook riffing on Back To The Future, Storybrooke style. 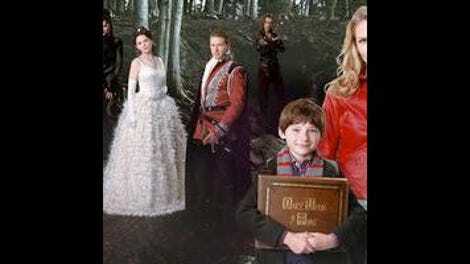 This being OUAT, the Marty McFly homage offered a valuable opportunity to club viewers over the head with its familiar concepts of home and family, but for once, the story led the sentiment, and not the other way around. When Zelena’s death opens up the time travel portal, Emma runs toward the scary tower of fire without a plan, like Emma does. Fortunately Hook, obedient lapdog he is, follows her, and when she gets sucked into the portal, he jumps in after her, cursing himself for chasing this woman once again. Yes, the time-travel trope can be pretty tiresome, but I usually find the butterfly effect (or as Rumple puts it, the ripple effect) fairly entertaining, as long as it’s not a well visited too often. When Emma and Hook land in the Enchanted Forest (where Regina is still evil, Rumple is still sparkly, and Emma looks extremely fetching in various robes and gowns) right around the time Snow and Charming are supposed to meet. But Emma stepping on a branch misaligns their meeting (it’s the littlest things!) so she and Hook spend the rest of their time in Enchantedland trying to get her parents together. Even without Emma’s clunky McFly explanation to Hook at the start of the journey, we would have gotten the Back To The Future nod as soon as the Charmings’ stories started disappearing from the all-powerful fairy tale book. With some surprising help from Rumple as a kind of off-kilter Fairy Godfather, the duo pull it off, and (almost) all is well in Storybrooke. I said a few weeks ago that Hook has turned into the heart of this show, and all of his loyalty, bravery, and devotion to Emma finally paid off for him this episode. He was even jealous of his own past self making out with her. All he had to do was trade his beloved boat for her, with a little waltzing thrown in. It was a very satisfying payoff for our favorite pirate. OUAT has a way with finales: This one was so rosy gold (cute Prince Neal, Rumple and Belle’s sweet wedding in the woods), you knew that someone’s happiness was not going to be long-lived. Unfortunately for us all, it’s Regina (Evil Queen can’t catch a break! ), who loses her new almost-family with Robin and Roland when Hook and Emma bring Marian back with them from the Enchanted Forest (after awkwardly shuffling her unconscious self around to various places, not unlike a giant sack of potatoes). The reveal of Marian was gasp-worthy, and Regina’s old dark side roared back as she couldn’t even be happy for her boyfriend’s little boy getting his mommy back. And what happens when Robin finds out that it was Regina who ordered Marian’s death in the first place? When Regina threatens Emma with “You better hope to hell you didn’t bring anything else back,” it’s unfortunate, as the show has spent weeks building up Regina’s good side, so the return to the Evil Queen would be a pointless retread. But hey, sometimes that’s the Storybrooke way. One last thing does come back with the trio from the past: a syrupy blue substance that morphs itself into Elsa, the Snow Queen. To the delight of millions, Once Upon A Time will go Frozen next season. Well, she sure walked out of that barn with a purpose. This finale shows the best of OUAT: Rumple conjuring magic, Red turning into a wolf, and a lovely blend of magic and fairy tales mixed with real-life concepts like family and home. When Emma sees her mother torched by a fireball (something that would only happen in a place like the Enchanted Forest), she realizes for the first time what she’d be giving up by moving to New York. It’s a crazy family, to be sure, but it’s hers, and the finale ends with Emma, who still thought of herself as an orphan as recently as Neverland, finally finding a home. Unfortunately, the rest of this season got too bogged down in other fantasy realms. As much I enjoyed the interplay between Peter Pan (Robbie Kay) and Rumple in Neverland, all those weeks there were just so long and dark and tedious. The show fared better in Oz, even though there were some giant leaps in logic (Grumpy explained that Princess Aurora got turned back into a human from a flying monkey right before she was due to give birth. Now she’s wearing her Enchanted Forest outfit in Storybrooke. No sign of Philip that I could see.). Oz also minimized Robert Carlyle by turning Rumplestiltskin into Zerena’s puppet; even though he got his evil mojo back at the end, this was a waste of the show’s best character. Still, Oz was a fun exploration for the show to take on, but there was no question how things were going to end up: At one point, Snow asks Emma if she’s headed back to New York when this is all over, as of course they’ll be defeating the Wicked Witch any day now. This finale shows that the Storybrookers can do just fine on their own, so I’m hoping they stay in familiar places rather than Narnia or Agrabah or wherever the hell else next season. So glad to see Meghan Ory appear as Ruby; now that Intelligence is cancelled, hopefully she’ll be back more often. Old school Rumple was hilarious as Emma tried to explain to him how she and Hook arrived from the future: “It’s quite a tale you’re spinning.” But Carlyle also killed it at the end when he tried to find out from Emma what happened to Neal. Speaking of Michael Raymond-James’ character, who keeps showing up again just when I think he’s gone for good, I liked that the Charmings named the baby Prince Neal. Emma seems slow to catch on to the facet that since she’s from the future, no one she recognizes is going to recognize her. I’m glad they’re such a happy family and all, but Henry calling Charming Grandpa is just weird. What is with the outdated technology in Storybrooke? The jail has a BetaMax recorder? I inherited this show from the excellent Oliver Sava this season, and although I probably whined too much when we were stuck on that Neverland island, it really was a lot of fun to cover; thanks for reading. The folks that watch it so intently (looking at you, commenters) delved deeply into the mythology and symbolism and nods to other stories. My first week, I believe there was a back-and-forth in the comments about whether mermaids had horizontal or vertical scales. I am grateful for discussions like those, as they helped enhance the OUAT viewing for all of us.